This is me in a cemetery in Saint Thomas Rest Park, Crows Nest. Dad took me there the other day. We used to visit all the time when I was younger. It is a great place for an old dog like me. 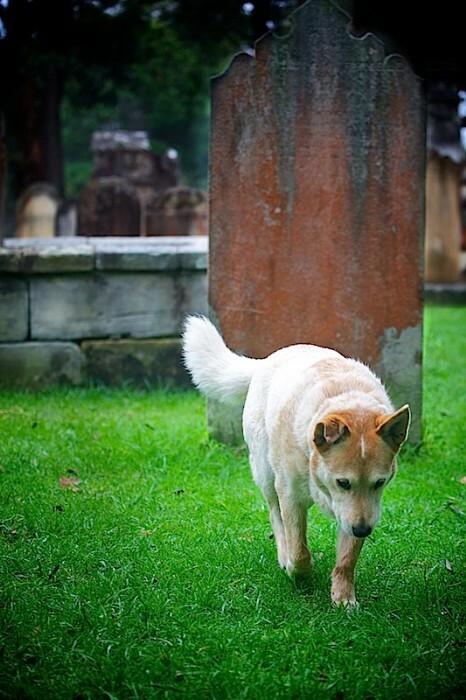 It's full of gravestones that I can walk between with lots of other dogs to play with. All the tombs are still there and they are some of the oldest in Australia. The smells are incredible. It is now a dog park as well as a people park and one day Dad got the idea to write a book called 'Dog Walking in a Cemetery' while we were there. The book would have told the stories of the people buried in the graves and the ones who come now to walk their dogs. Anyway it changed to become a story about our journey to the centre of Australia. But in the new book - The Electronic Swagman - a Man, a Dog, the Road and a Lot of Dead People - we still visit cemeteries all along the way and look at the lives of the people buried in outback graves as well as writing about me, and Dad and Australia of course. It is interesting to go back to where an idea was born and see at how it has changed and how it has changed us. Because Dad wrote that book we are now writers and photographers traveling around and collecting stories all over Australia. Because he got that idea and wrote that book he is now The Electronic Swagman and I am his dog. Mind you, I am a lot more famous than him. You would love our book Alison - all these stories of Australia rise up exactly as you have described. I have a penchant for old graveyards too Tommie, not in a morbid way but like your dad I wonder about the lives of the people laying in there. Woof! Cemetaries - yes. Interesting to visit. Where I live, there is one which contains the stories of a Flue Epidemic w-a-a-a-y back in the day. Or drownings. One reads a bit of the town's history right there on the tombstones. Enjoy your wanderings and smellings, dear Tommie!